Not in the mood to stay in a hotel on your Cabo vacation? With a Cabo vacation rental, you can dine on your own time, have more space, avoid cookie-cutter room types and avoid sharing the pool with strangers. 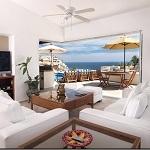 Owners of some of the most fabulous villas in Cabo San Lucas are opening their doors to renters like you. In Cabo, villas rented from their owners can be more affordable than most hotels and can accommodate larger groups for events such as weddings or corporate retreats. One of the best reasons to spend your time in a Cabo villa is to experience the luxury, privacy, and unique amenities offered. These homes typically provide fantastic interior design and comfortable living space. Swimming pools, private Jacuzzis, maid service, and chef services are examples of some of the amenities you may find in these Cabo villas. As well, many of the vacation rentals are located near many of the key points of interest that make Cabo San Lucas one of the best travel destinations in the world. And the views from your Cabo villa… priceless. Perched on an encompassing cliff space in the Pedregal, facing the meeting point of the Sea of Cortez and the Pacific Ocean. 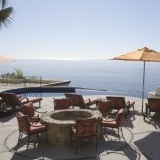 Casa De Los Suenos provides one of the most breathtaking views to be had in all of Cabo San Lucas. Villa del Toro Rojo provides a relaxing, secure and affordable getaway hidden just steps away from downtown Cabo. 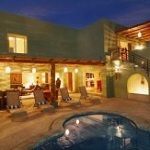 Experience the tranquility, beauty and comfort of a luxury Cabo villa. It will be a vacation to remember. Villa Luna Nueva is nestled in the hills directly above Cabo San Lucas in the exclusive, private, gated community of Pedregal. It is the perfect spot for those looking for privacy, guaranteeing your own special hideaway.